You could make an argument that the NFL has embraced technology more than any other major sports organization. Today’s NFL fan experience is inundated with technology – from mobile streaming live games to adding RFID chips to the ball itself – NFL fans, players, coaches, and owners walk hand in hand with silicon valley’s brightest minds in 2018. For fans, the impact of technology is ever-present. When they watch games from home, they can consume real-time stats, commentary, and game analysis on handheld devices. And when they watch games live at the stadium, their devices serve as a personal guide – offering up special promotions and limited-time offers, and even helping them find the shortest restroom line. But every now and then a new technology shows up that is simply too much for even this forward-thinking league. The league’s leaders feel that some aspects of gameplay and fan experience need to be protected from the intrusion of new technology. And one such example created quite a stir at this year’s spring owners’ meeting. The proposal that got everyone buzzing at the spring meeting would allow coaches and players to take advantage of video replays and analysis during the game – on sidelines and in the coaches’ booths. Video would be made available on the Microsoft Surface Pro tablets that teams already use to analyze still photos during games. While ownership seemed inclined to go along with the video proposal – most coaches in attendance made their objections loud and clear. The predominant cause for objection was not related to fan experience, but was essentially about the gamesmanship between coaching staffs. Coaches believe that the ability to recognize and respond to the other team’s strategy and tactics is an art – and that excelling at this art is what separates good coaches from bad. Those who believe themselves to be among the league’s best coaches feel that they would forfeit a valuable advantage if their rivals had access to real-time video during the game. A few coaches, including the Seahawks’ Pete Carroll – did not see the in-game video as a threat to their teams’ success. Believing this to be one of many unavoidable changes that technology will bring to the game, these coaches argued that the impact would be minimal. But the voices of the concerned coaches won the day – and the proposal for in-game video was tabled; not to be discussed again until after the 2018-2019 season. The strong objection to in-game video review took many by surprise – given the degree to which the NFL has accepted and embraced technological improvements in recent years. Within just a few short seasons, the league has witnessed the advent of cameras inside the end-zone pylons and cameras in players’ helmets. Audio improvements have been just as prolific, with coaches and players now able to communicate wirelessly – and players wearing special microphones to provide the experience of field-level sounds to remote viewers. Players have worn RFID tags in their shoulder pads for several seasons, giving coaches access to new insights about player position and speed. And next season, the ball itself will carry an RFID chip – opening the door for a new and detailed set of ball-specific stats and analysis. But the impact of technology for players is dwarfed by its impact for fans, who have watched in awe as technology has made the NFL fan experience more exciting, more immersive, more interactive, and more personal than ever before. In 2018, NFL fans enjoy an exciting and interactive fan experience – whether they’re watching from home, sitting at the 50-yard line, or holding it down all day long on the tailgating lot. The league’s partnership with Verizon means that all its games are available for live online streaming – a first in American sports. And with the addition of an RFID tag to the football next year – the advent of serious augmented reality applications is just around the corner. Fans at home and in the stadium will be able to focus their attention on specific aspects of the game, and they will gain new insights into the subtle actions and reactions of their favorite players. 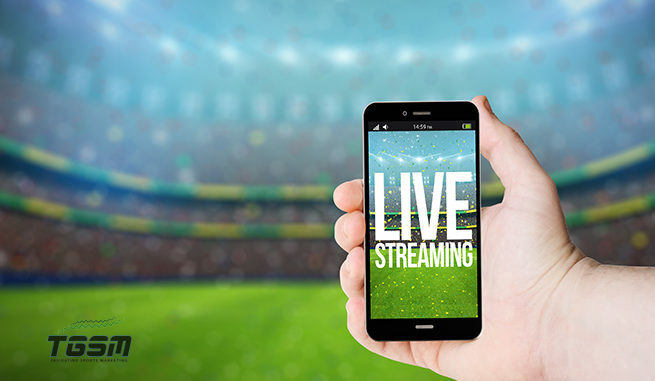 As technology has opened new channels, the content streams that are available to fans has grown exponentially, with personally-tailored predictions and analysis based on the preferences of the individual fan and the schedule of their favorite teams. Being an NFL fan in 2018 means being connected to a constant flow of detailed statistics and expert analysis. TGSM’s mobile brand activation assets create a seamless experience for venues and brands seeking to extend their high-tech fan experience to the tailgating lot – a bastion of tradition where technology has not often ventured. Many teams have found the tailgating lot to be an anomaly in their marketing plans – this hallowed ground, renowned as the heart of any team’s most loyal fan base, has been impervious to teams’ efforts to expand their focus across diverse demographic segments. TGSM’s mobile assets have bridged an important gap at venues across the country – bringing women and millennials to the tailgating lot and getting them more involved in the team’s activities and planned fan experience for the entire season. Our state-of-the-art luxury restrooms offer an oasis of comfort and sanitation – a welcome sight for women and families who dread the conditions of the tailgate port-a-potties. And our free high-speed Wi-Fi attracts millennials and social influencers, who engage with the asset’s interactive screens, games, live broadcasts and socially-integrated selfie booth. At every step of their interaction, your brand harvests a wealth of valuable data points that can be used to refine your audience definition and expand your reach for future marketing efforts. If you would like to learn more about bringing a cutting-edge fan experience to your tailgating lot, contact TGSM today at (877) 995-2285 to speak with one of our trained representatives. We’ll show you how our units have instantly transformed the demographics of tailgating lots around the league, and answer any questions you have about how our assets can integrate with your existing activations and engagements.